Friends, have the opportunity to win a discount -15% for the WHOLE of 2018! To do this, just need to make and to order in our store.An order must be made in the period from 05.10.2018 on 15.10.2018 in the amount of 2000 rubles. + to specify the promotion code 15GOD (in the comments to the order or the Manager on the phone). The contest will be randomly selected 10 winnerswho will receive a discount of 15% on all 2018 in our store. * order amount must be at least 2 000 RUB., excluding the cost of delivery. * contest results will be announced on 15 November, after delivery of all orders entered in the competition. * the system will randomly selected 10 winners. The 10 winners will receive an annual discount of 15% on the products in our store. * the competition is only in stock. 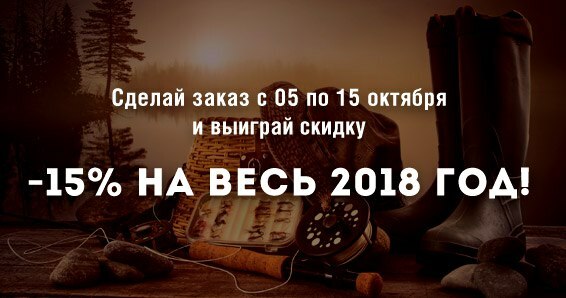 * in the Personal Cabinet of Winners will be recorded a 15% discount. * competition is valid only for retail customers. * the participation in this contest Gift cardis not valid!